There is a wealth of material in this book for the up-to-date performer, amateur or professional, and while it is fresh is the time to make a hit with it. Some of the shorter selections are just the stuff for encores. Or they can be assembled and strung out in such a manner as to keep the audience screaming while you are on the stage. The “rapid fire” by Harry L. Newton is worthy a place on the most select bill. More than a century after its original publication, this humor is definitely no longer “fresh.” However, some small parts of it, like Harry L. Newton’s surreal “Fifteen Minutes with a Playwright” segment, are at least weird enough to merit a slightly longer look than the obvious punnery and stereotype-driven jokes that tend to dominate the humor of this period. For those wondering just who Will Rossiter actually was, a biographical article in the July, 1927 issue of “The Rotarian” sheds some light (and includes a picture). Apparently Rossiter was a successful music publisher, known for such record-breaking hits as “I’d Love to Live in Loveland with a Girl Like You.” While the biography makes no mention of involvement with vaudeville or book publishing, the existence of these books suggests either that he decided at some point to branch out into other forms of publishing, or that an enterprising publisher simply decided to use his well-known name as a promotional tool. 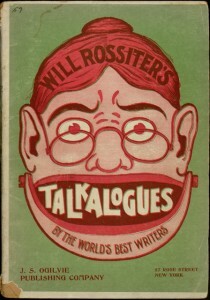 Either way, it appears that while Rossiter’s popularity lasted long enough for the publication of a fond remembrance in the 1920’s, his status as a household name did not survive too much further into the twentieth century, making him just one of many forgotten celebrities of the vaudeville era. For those wishing to be reminded of this bygone era, the entire text of Rossiter’s collection may be read online or downloaded through Project Gutenberg.